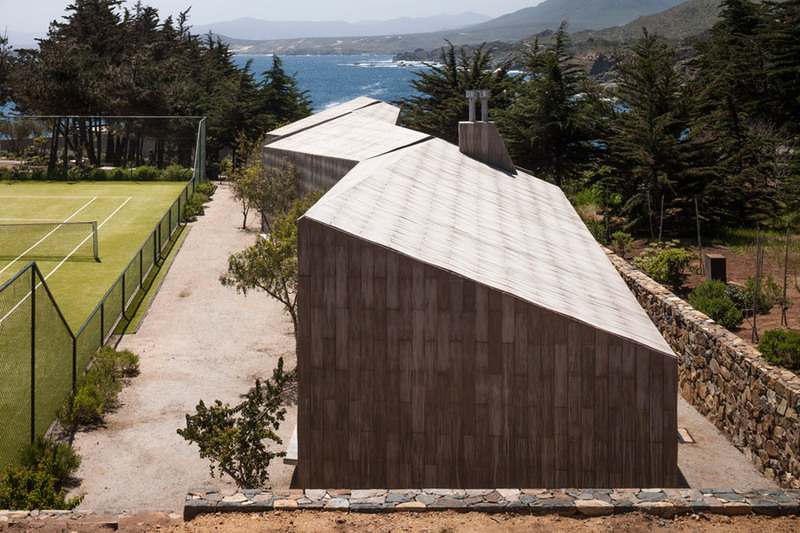 A sauna, gymnasium, baths and caretaker's lodgings are housed in these four buildings at a seaside tennis court in Chile, which were planned by Felipe Assadi Architects to look like one long but disjointed building. 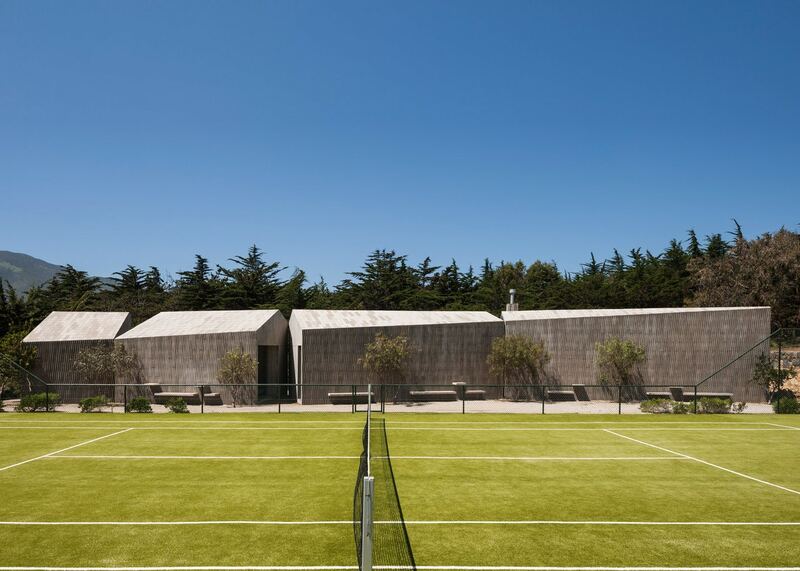 Designed by Felipe Assadi in collaboration with Francisca Pulido and Alejandra Araya, the Pabellón de Cuatro Usos – which translates as pavilion with four uses – provide facilities for a tennis court near the coastal city of Los Vilos. 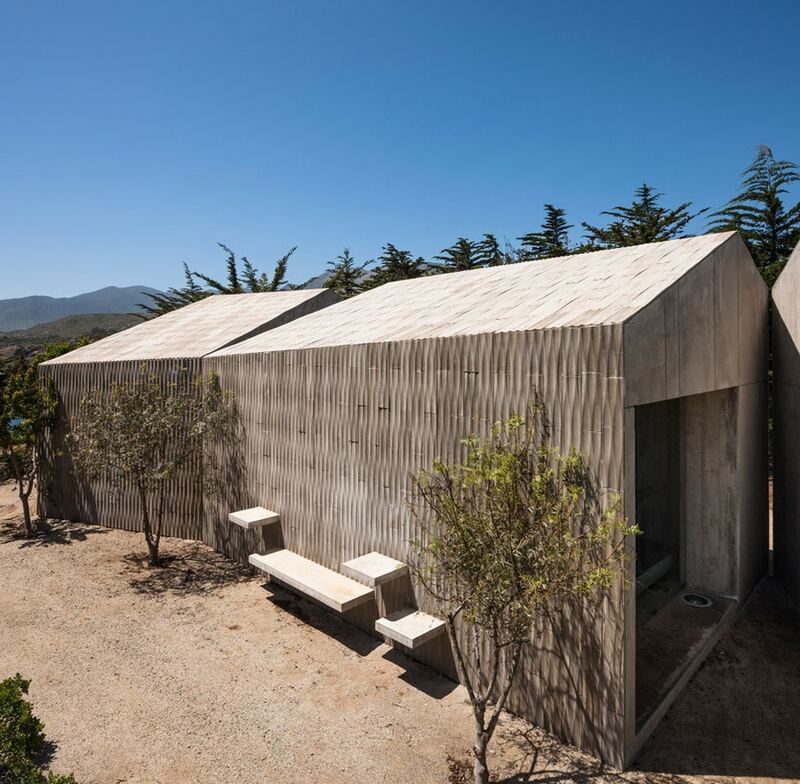 The site offers views of the South Pacific Ocean, and has a mountain range and coniferous forest as its backdrop. The buildings are arranged in a line, but each is angled away from it neighbour. This arrangement creates three narrow triangular courtyards in the spaces between, and gives the complex a zigzagging plan. But the four blocks all touch at the corners, creating the appearance of of one long and fragmented building. The fragmentation provides the necessary separation between the caretaker's living quarters and the facilities for the resort's guests. It also gives tennis players easy access to the sauna, baths and gym. 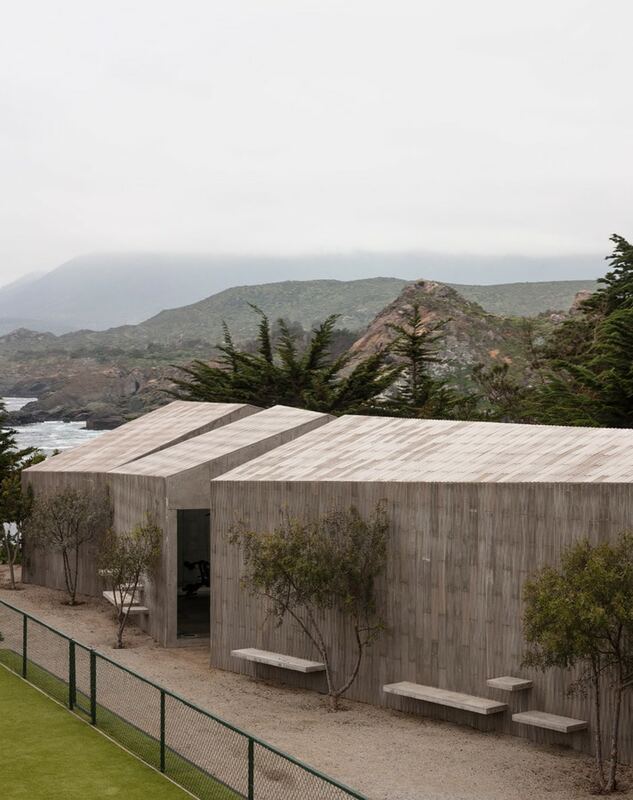 "The commission was for a pavilion bordering a tennis court that could handle four programmes," said the architects. "The two central programmes were to be related to the tennis court, but not the lateral ones," they explained. "At the same time, the three sports-related programmes were to be interconnected, whereas the lodgings were to be isolated from the rest." 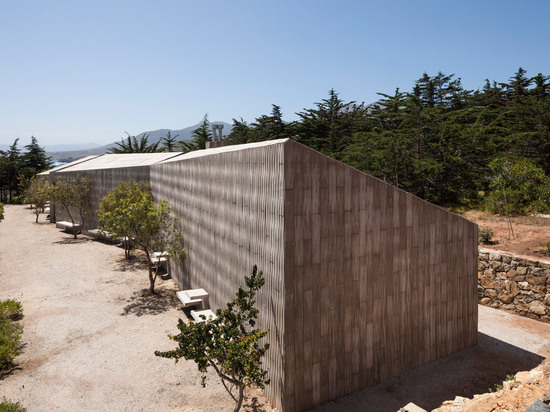 The outer walls and pitched roofs of the buildings are both covered in concrete tiles, each with a subtly scalloped surface. The colouring matches the strip of gravel that separates the complex from the tennis courts. 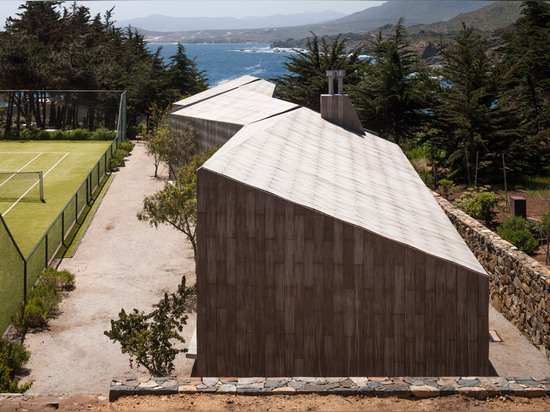 The angle of the roof varies across the four buildings and the ridgelines follow the plans of the buildings to create irregular pitches. 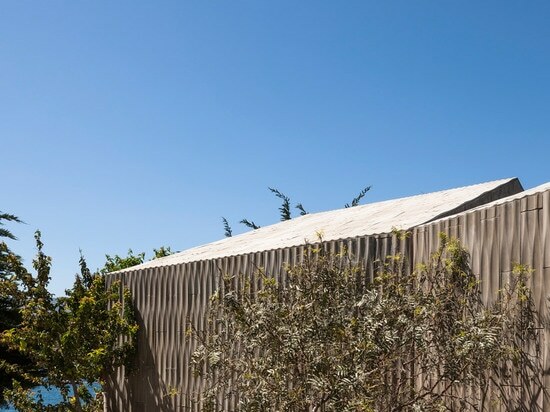 "We worked along a single strip, with the same material, and a pitched roof, recognisable from every angle," said the studio. 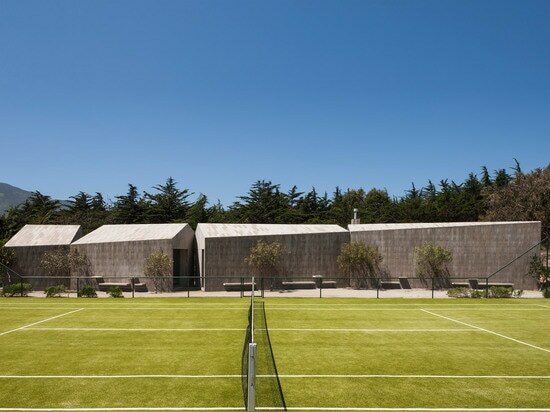 Concrete benches and small tabletops built into the walls facing the tennis courts provide casual seating for match spectators, shaded by nearby trees. These walls are windowless. 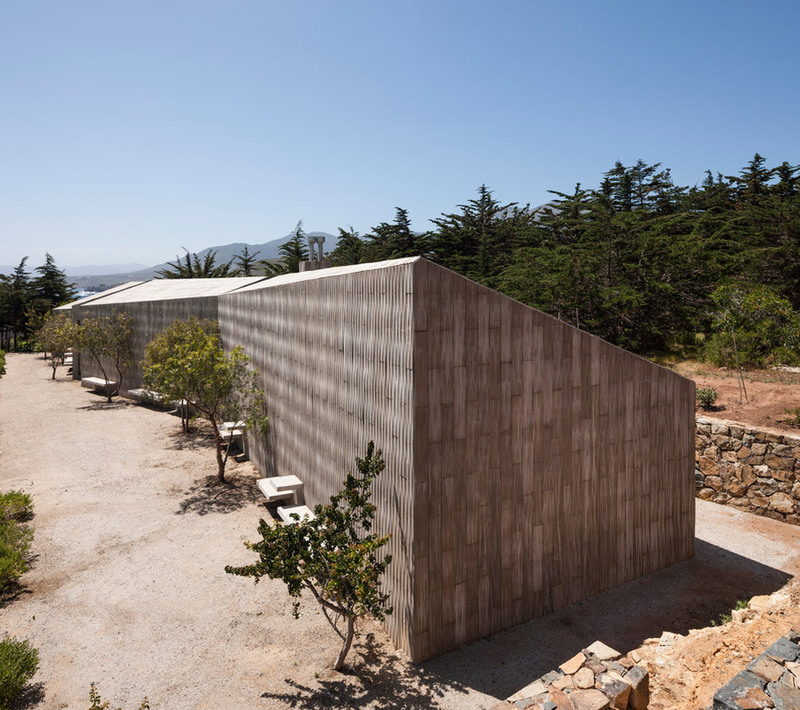 But there are glazed doors placed in the gable end of each building, while small windows face towards a stone wall and into the forest on the other side of the site. The windows are positioned high and low in the walls, affording the inhabitants with a degree of privacy from passersby. "We synthesised the problem of the interrelationship of the programmes by making three sections in the building and then slightly shifting the sectioned parts," said the architects, "thereby generating entrances into each part and relating their interiors with the landscape into which they were inserted." "The result, in spite of the sectioning, is still a single piece, able to 'remember' its original state, before the cuts were made," they added. 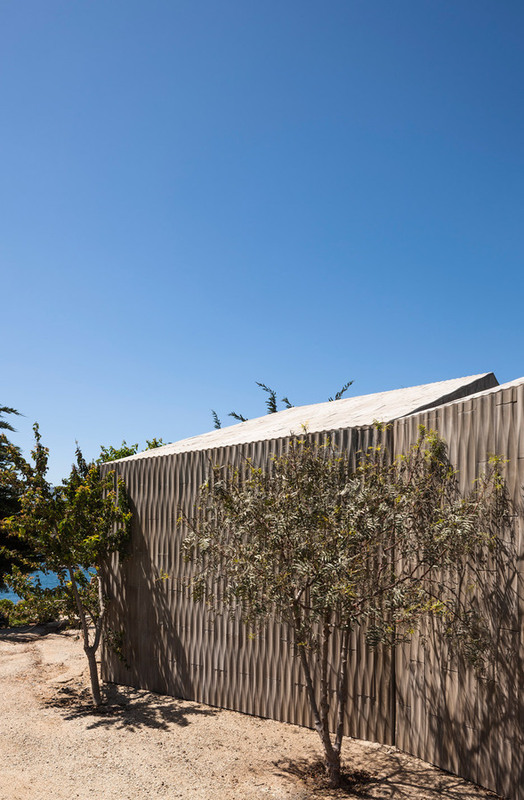 Interiors finished in exposed concrete and stone host gym apparatus and glazed bathing facilities for the guests, and a single bedroom house with an open-plan living room for the caretaker. 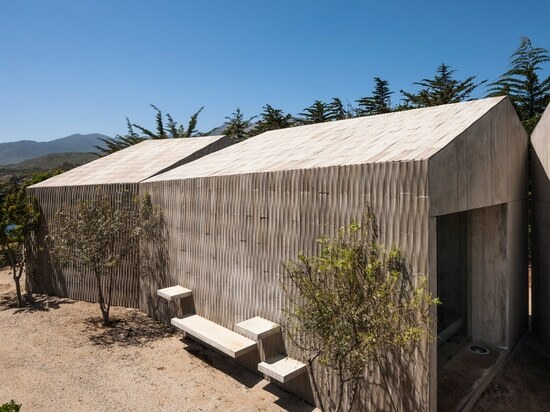 Assadi's studio is based in Santiago. 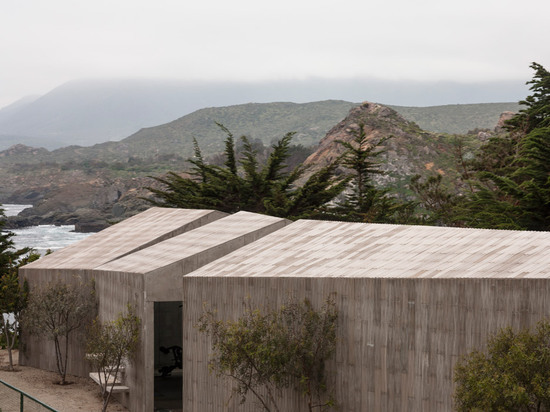 The architect also recently completed a concrete painter's studio for the gardens of a cliffside house, also on the Chilean coastline.